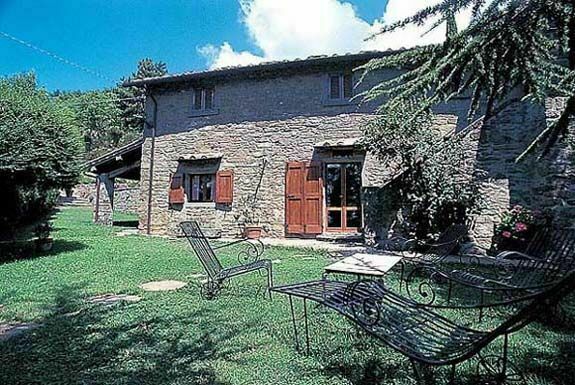 A luxury accommodation in Tuscany, a lovely stone farmhouse beautifully situated amidst the hills overlooking the town of Cortona in very quiet location. The farmhouse, offering enchanting views over Lake Trasimeno and the Chiana Valley in Tuscany, was tastefully restored preserving its ancient charm and many of its original architectural features like the terracotta-tiled floors and the charming beamed ceilings. The house, which was restored to be an independent luxury accommodation is elegantly furnished with antique pieces.The property is completely fenced. Distances: a food shop is approx. 500 m away, the centre of Cortona approx. 2 km, Arezzo approx. 30 km. Perugia and Siena are within 50 km while Lake Trasimeno with equipped beaches is accessible in a 20-minute drive. A tennis court is 2 km from the villa away. At guests' disposal: large, beautiful terraced garden equipped with garden furniture and private swimming pool (10 x 5 m – maximum depth 2,4 m - open from 30/05 to 30/09) set in panoramic location overlooking Lake Trasimeno and the Chiana Valley. Windows on first floor are provided with mosquito nets. Parking within the grounds. Counter telephone available. Steam iron at the guests' disposal. Extra services: baby bed available by paying an extra charge of € 52,- / per week to be paid on the spot. Maid service available by arrangement (€ 15,- / per hour to be paid on the spot). Arrivals on Saturdays between 16.00 and 19.00 and we are unable to accept later arrivals. 180 m2. Ground floor: large kitchen (oven, freezer, toaster, dishwasher) with fireplace and dining area, living-room with piano (non-functioning), parlour with fireplace (satellite TV), bathroom with shower (washing-machine). 1st floor: living-room with fireplace, 2 double bedrooms, twin-bedded room, toilet, bathroom with tub. Additional costs paid on site: Security deposit: € 400,-Final cleaning: € 150,-Heating: € 30,- per day or € 200,- / per weekElectricity: according to consumption.